Personalised Gift Certificates for Defensive Driving Programs are now available. Gift Certificates become valid on the day the gift is given and remain valid for a period of 3 months. Gift Certificates are available for all special occasions including Birthdays and Christmas. 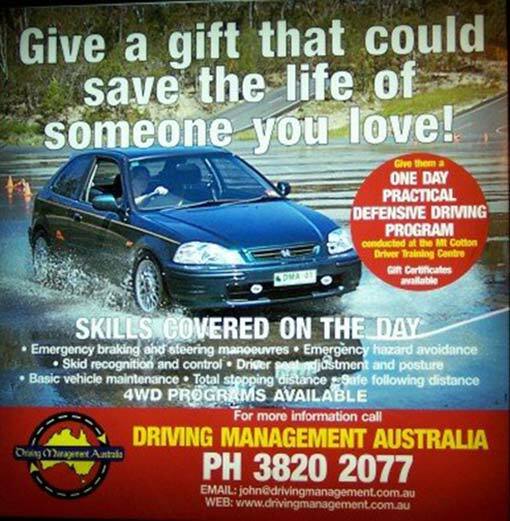 If you would like to order a Driving Management Australia Gift Certificate, please fill in the form below. You will be directed to paypal on submission where you can pay via paypal or credit card. We will contact you via email with all further details. This cost includes arrival tea and coffee, morning tea and a light lunch. All participants are issued a ‘Certificate of Completion’. Please order your Gift Certificate below. PLEASE NOTE: Gift Certificates are transferable but NOT refundable.